Sheffield’s New Era Square completed phase one of its development yesterday (17 September), as investors and councillors gathered to cut the ribbon on the city’s own “Times Square”. 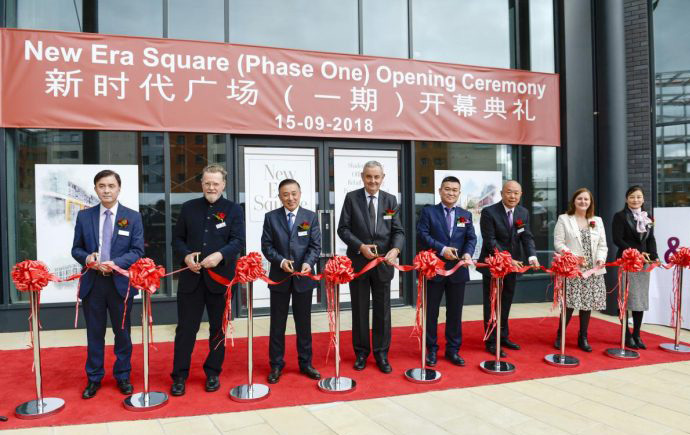 Founded in 2013, the New Era Square development team set out a vision to build a “Sheffield Chinatown”, consisting of luxury apartments accommodating 686 students and 14 private residencies in a skyline-dominating 21 storey tower – the fifth tallest in the Steel City. The square will also act as a hub with a variety of cafes, international restaurants and retail units like KH Oriental supermarket, Costa Coffee and Dunkin’ Donut. Jerry Cheung, managing director of New Era Development LTD said: “Everyone at New Era Development are thrilled with the launch. Phase One has been a long time coming; this project has been in the works since its conception in 2005 so to have reached the official half-way point is incredibly exciting. Councillor Mazher Iqbal, cabinet member for business and investment at Sheffield city council, said: “It’s been great to witness the New Era Square developments up close and to celebrate this remarkable achievement for the city centre.